← Can I Replace my HP Pavilion G7 Screen? A cracked or broken Lenovo G560 screen can be a source of great frustration. However, laptop screen replacement requires very little technical expertise, In fact, some of our customer have managed to replace their broken screen in just half an hour. Take a look at all of the kind testimonials we have received from satisfied clients. Below, you'll find instructions that will help guide you, successfully, through the Lenovo G560 screen replacement process. Before you begin your repair, unplug your laptop from the main power and remove the battery. Remember, also, to make sure that you have disconnected all peripheral devices, (such as memory sticks and or speakers.) When you're ready to begin, use a flat edged implement to prise off the aesthetic covers, (used to disguise the screws,) on the front bezel. Note: there should be six aesthetic covers in total. Once you've removed, (and set aside,) each of the screw covers, remove the screws underneath and, set them aside also. Next, use a flat edged implement or your fingers to work the front bezel away from the rest of the screen casing. Apply gentle, (yet firm,) force, taking care not to snap the front bezel in the process. 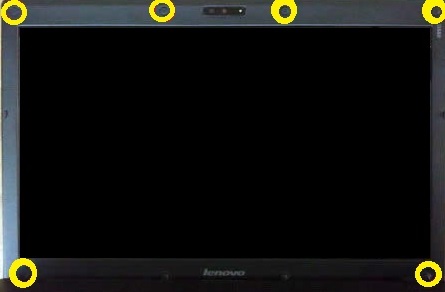 Note: the front bezel is held in place by a number of plastic clips. Take care when working it off. Once you've sufficiently loosened the front bezel, remove it from the laptop and, set it aside safely. Having removed the front bezel, you should see the broken Lenovo G560 screen siting in a metal holding frame. 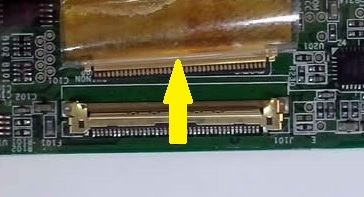 Pull the top of the screen slightly towards you and remove the screws located on both sides of the display. Once you've removed the screws on each side of the screen, pull it towards you and lay it to rest, face down, on the laptop keyboard. You should now be able to remove the broken Lenovo G560 screen from the laptop. To fit your newly bought replacement screen, simply complete the above instructions in reverse.